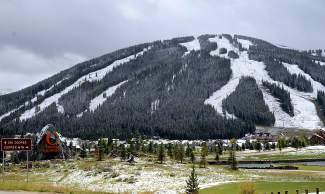 A storm system hit the high country Sunday night dropping up to four inches of snow at peak elevations, including at Copper Mountain, pictured here. Although the snow should be melted by mid-day, more snow is in the forecast for later this week. The snow gods graced Summit County with their glorious presence this week, dropping Sunday night nearly 4 inches of snow at peak elevations. However, officials with the National Weather Service said it’s still early and cautioned local ski bums and knuckle draggers from pulling their boards out of storage. By mid-day all of the snow will be gone, if it hasn’t already melted. Summit County should experience a warming trend for the rest of this week, Dankers said, but the return of blue skies will be brief. Beginning late Thursday or early Friday another system is likely to blow through, bringing with it more snow for Summit County. Taking into consideration unseasonably heavy rains and this week’s small taste of winter, it would only be natural to ponder about what’s in store for the coming season. Although encouraged by the approaching storm front, Dankers said it’s still too early to start talking powder predictions. Those storm trends are often disrupted by periods of high-pressure systems known as ridges, Dankers said. The next few days of warm weather is an example of a ridge. In the High Country it is not uncommon for a ridge to move in during late June or early July and linger for several weeks, Dankers said. Those ridges divert storms from Summit County and are responsible for more typical periods of late summer drying. “The thing I take away from it is we had a week of heavy rain last week, followed by a little ridging before last night’s rain,” Dankers said. “We’re in some ridging now, but it’s encouraging to see a weather system already coming in later this week.